Bill's off school today. He's a bit ill but not very ill. So far he's gouged some eye holes out a large cardboard box, done some posing and ambushing with the pressure washer hose gun, mucked about with Lego, flicked through the Guinness Book of Records and is now lying on the carpet moaning gently- mostly for effect. It's probably time I read him some more story to accompany his moans. There's been a bit of discussion/blogging recently about whether and when children grow out of being read to. I was delighted to see via the comments section on this great post by Clara Vulliamy that the consensus seems to be never. Clara herself read 'War and Peace' out loud to her son. This deserves Special Mentions and Ribbons in the roll call of reading out loud Honours I think. I have banged on about this before but I want to bang on about it again- reading to a 9 year old is different to reading to a 4 year old (which is different to reading to a baby of course) but has even richer rewards. You get to go deep over days or weeks into another place, you get to milk cliffhangers, you get to experience proper big exciting stuff together. You may even get to make you both cry. It's all good. 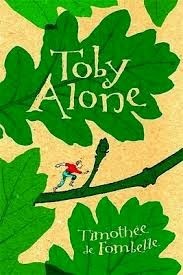 The last book we read was 'Toby Alone' by Timothee de Fombelle. This definitely had moments for all of the above in spades. Translated from the French I knew this book had fans among some Twitter friends but both Bill and I came to it fresh. That's the best way I think- neither of you quite knowing what's going to happen next. Bill wouldn't have the patience to manage 'Toby Alone' on his own yet. The narrative shifts time frame confusingly and some of the language is a little laboured (although that may be due to translation). There are also a lot of trickily named characters that take a bit of learning. Not a bad stand in for working up to reading 'War and Peace' perhaps then? It's also not a bad stand in for that book in being a dizzyingly good piece of world creation with a gripping story to tell. The world created here is 'The Tree'; a nation state whose self-sufficient millimetre tall inhabitants are uncertain and distrustful of what lies beyond their branches. The story has lessons to teach about the environment, the management of natural resources and also about the dangers of nationalism and totalitarianism. This could be overly-didactic but isn't- thanks to the central story of on-the-run 13yr old Toby and the life-threatening danger he more or less constantly finds himself in. We both loved it; particularly the even-smaller then the Borrowers world scale: A puddle in the crook of a branch becomes a vast lake, insect grubs - farm animals, a mosquito - a monstrous assailant to fight. A book both serious and charming. Now we've (lacking the sequel to 'Toby' as yet) moved on to a different but equally enjoyable dose of ecological doom in the form of Piers Torbay's 'The Last Wild'. I have the advantage of Bill this time because I couldn't resist reading this all myself first. Coo it's a bit of a page turner. Another on-the-run (albeit of standard size) boy with a mission, Kester has the gift to communicate with the last surviving animals of a viral catastrophe which has left the whole world in thrall to sinister pink-gloop food manufacturer Facto. 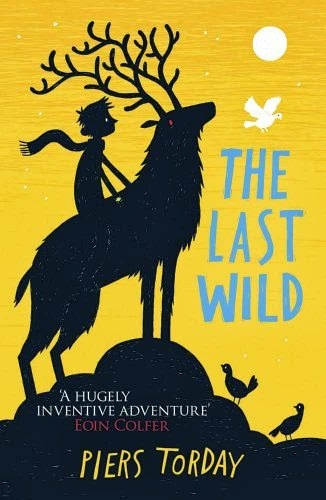 'The Last Wild' manages to be simultaneously dystopian, heart wrenching AND funny and you can't ask for more than that can you? I love the imperious cockroach General and the cocky young wolf. We're about half way though now and I'm not allowed out in the evenings at the moment or Bill will miss an installment and sulk at me loudly the next day. There's about to be a sequel to that too- and then a third. Perhaps all the best read aloud books come in three volumes? War and Peace here we come then. Just keep reading to them. It's tops. I totally agree on the 'never give up on reading aloud to them' after all it isn't so very long ago that the only way of sharing a story with your children if few if anyone in the family could read was to tell the story or make it up as you went along, and this would have been family of all ages listening to the storyteller. I have treasured memories of Sunday evenings when my late mother read aloud to my sister and I into my early teens, Little Women and Good Wives being the most vivid of these recollections (I was making something as she read of Beth's death and it was hard not to drip tears on my work as I listened). My aunt read to my younger boy cousin right into his teens and was horrified when I said I no longer read out loud to my elder child as she had become a teenager, I've since rectified that mistake and got her hooked on a book she hadn't considered! That's fantastic- congratulations on getting her back into the habit. My father read to me nightly- not quite into teenage years but nearly. Then he used to read to us all occasionally round the fire on rainy Welsh holidays. Some of my best memories- shivering to M R James ghost stories. Thanks for your visit and comment.